From time to time I shun the chance of a road trip, opting to explore closer to home instead. Last Sunday was one such day. It was also Mr G’s birthday and the penultimate one of his thirties. Having consulted the Scottish weather forecast within a 2 hour radius of home and seeing grey, grey and more grey I decided that we’d be as well taking a wee daunder (Scots for walk) around Edinburgh instead of spending hours in the car for a grey walk elsewhere. Mr G asked if his walking gear would be required and when I said no, we’d only be walking in the Old Town he looked bewildered at the prospect of donning civvies for a day out. The Wee White Dug had no such problem dressing for the occasion and like a true Edinburgher he donned his navy quilted jacket and a Harris Tweed bow tie. We started our walk in the oasis of calm in the centre of town, known as Princes Street Gardens. In the gardens we met ‘Soldier Bear’ one of Edinburgh’s newest statues. Wojtek was a beer drinking bear adopted by Polish troops during World War II. He helped carry ammunition at the Battle of Monte Cassino before spending his retirement years at Edinburgh Zoo. Up The Mound we went. The Mound was created when debris from the building of the New Town was dumped in a pile on the fringes of the Old Town giving the city yet another hill for its hill weary residents to climb. We made our way past the fairytale houses of Ramsay Garden next to the castle. If you ever pass look closely at the rooftop of the building in the centre known as Goosepie House (I’ll come back to that name in a minute). You may spot the silhouette of a cat but don’t be fooled as this is Edinburgh and behind Edinburgh’s genteel exterior hides a dark and more sinister side. That’s no cat you can see up there on the rooftop, it’s the devil! And as for the oddly named Goosepie House which was built around 1740 and was the home of the Poet Allan Ramsay. It was named because of its unusual eight-sided shape which resembled a pie dish. Next on our jaunt we stopped at the funny mirrors outside Camera Obscura, a popular Edinburgh tourist attraction. Post Christmas eatathon Mr G and I loved the mirror that turned us into instant beanpoles. We quickly hurried by the short and fat mirror, fearing it may be a normal mirror. It was starting to feel like coffee o’clock so we grabbed an Americano each from the vintage Citroen van serving hot drinks on Castle Esplanade. We admired the views of Edinburgh from our vantage point. To the south lay the Pentland Hills, the historic Greyfriars Kirk and the castle like turrets of George Heriot’s School, JK Rowling’s inspiration for Hogwarts. North we could see Princes Street Gardens, the New Town and across the Firth of Forth to Fife. The boy caused a bit of a stir amongst the tourists who took great delight in meeting a wee Scottish dug outside Edinburgh Castle. Our next Edinburgh destination was Victoria Terrace to admire the pretty, colourful Victoria Street below. Victoria Street is home to a host of wonderful shops and eateries. It’s also said to have been JK Rowling’s inspiration for Daigon Alley. It’s easy to see why, as at the foot of Victoria Street is the West Bow, once home to one of Edinburgh’s most notorious characters – The Wizard of West Bow, Major Thomas Weir. In 1670 Weir was tried and executed for witchcraft having confessed quite out of the blue that he was in cahoots with the devil. So steeped in tales of terror was his house that it lay empty for 100 years after his death. Greyfriars Bobby and ghostly goings on! Next, a more heartwarming Edinburgh tale. That of a loyal Skye Terrier named Bobby, who’d become known the World over as Greyfriars Bobby. Just outside Greyfriars Kirkyard you’ll find a statue of Bobby. After his master John Gray died Bobby spent 14 years visiting his graveside in Greyfriars Kirkyard. He was so loved by the people of Edinburgh that the Lord Provost paid for his licence and gave him an engraved collar to ensure that he didn’t fall into the hands of the dog warden. If you visit him please don’t rub his poor wee nose. Us Edinburghers are really sad to see the statue of our lovely wee dog being damaged because of a story made up by a silly tour guide. It’s never been an Edinburgh custom to rub Bobby’s nose for luck. If you want to pay your respects to Bobby you’ll find him buried just inside the gates of the kirkyard. Greyfriars Kirkyard is a wonderful historic cemetery and my favourite place in Edinburgh. In true Edinburgh fashion, alongside the heartwarming tale of Bobby comes the dark tale of the malevolent poltergeist of Bloody MacKenzie. MacKenzie has been known to rise from his eternal slumber in the kirkyard to terrify and attack visitors. A true story? You decide. Our wander took us down Candlemaker Row and along the Cowgate, flanked either side by tall buildings making it difficult for the light to penetrate the street below. My Granddad was born here in 1914. I’d give anything to see the Old Town he lived in as a child. He held a lifelong love of Edinburgh and inspired my interest in the history of my hometown. We weaved our way up and down narrow closes and past the inviting glow of the Serenity Cafe, a social enterprise venture helping people fighting addiction. The Scottish Parliament was our next stop. Edinburghers fall into two camps, those who love the parliament building and those who loathe it. I love it. My favourite part of the building are the literary quotes on the wall, engraved in English, Scots and Gaelic. I also love the pools outside which attract adults, children and dogs for a paddle on warm summer days. There can’t be many parliament buildings in the World where people gather to cool their feet and eat ice-cream. Another Edinburgh favourite of mine is Abbey Strand which sits just outside the gates of Holyrood Palace. If you look closely at the cobbled street you’ll see it’s marked with the letter S in brass. The S stands for sanctuary. It was here that townsfolk desperate and in debt could seek refuge from their creditors. Creditors couldn’t follow them beyond the sanctuary boundary line. On Sundays debtors could safely leave their sanctuary and walk freely in town as law dictated that their creditors couldn’t touch them on the Sabbath. The wee dug posed like a turkey outside Holyrood Palace, home to the Queen when she’s in town. We’re sure he’d convinced himself he’d be invited inside for lunch but the invite never came, so we left and headed back up the Royal Mile. Outside the Canongate Kirk we bumped into the poet Robert Fergusson striding with purpose down the street. There’s a belief that Fergusson could have become every bit as famous as Robert Burns, but his life ended tragically in a mental institution when he was only 24 years old. He lies in the kirkyard under a tombstone commissioned by a great admirer of his – Robert Burns. Also inside the kirkyard in a now unmarked grave lies Ebenezer Scroggie. One evening while out for a stroll Charles Dickens happened upon Scroggie’s grave. Scroggie was a Corn Merchant or Meal Man but in poor light Dickens thought his stone read mean man. He was appalled that anyone could lie in their grave, remembered in such a terrible way. That fortunate misreading gave us Ebenezer Scrooge. Opposite the kirkyard stands the cheery, yellow Museum of Edinburgh building. Amongst the local treasures inside is the collar which once belonged to Greyfriars Bobby together with his bowl. We had a quick pit stop for lunch at the dug friendly Circus Café Bistro on St Mary’s Street. It was an excellent choice as their homemade lentil soup tasted just like my Nana’s used to. From me there can be no higher praise, as she was the queen of homemade soup. After lunch we made our way towards St Giles Cathedral which has stood watch since 1124, as the history of Edinburgh unfolded around it. Nearby, opposite the High Court building where the statue of David Hume sits with a big shiny toe (apparently it’s also lucky – it’s not), you’ll find H shaped brass studs on the pavement. This is the site of the gallows, and where notorious Edinburgh characters such as William Burke and Deacon Brodie met their end, watched by the baying Edinburgh mob. We finished our day by exploring the city’s historic closes, where the spirit of old Edinburgh is felt strongest. You can almost hear the cries of ‘gardyloo’ (watch out for the “water”) from above, making you want to run for cover to avoid buckets of waste being thrown out of tenement windows and onto the street below. In these dark passageways it’s easy to imagine Burke & Hare creeping around with murderous intent. Edinburgh is a city rich in history and wonderful tales. It’s a city with two very contrasting sides of light versus dark, good versus evil. It’s a contrast of genteel dinner parties and polite conversation in the new Town, and tales of witchcraft, hauntings and murder in the Old Town. Edinburgh is the city that was at the forefront of the Enlightenment in the 17th and 18th centuries, and was known the World over as a hot-bed of genius. It’s also the city that gave us Burke & Hare and inspired Dr Jekyll and Mr Hyde. This is Edinburgh, my weird and wonderful hometown. I hope you enjoyed your whistle-stop tour of its delightful Old Town as much as I did. That was marvelous! I can’t wait to visit and use the tips from this and all your other enjoyable posts. 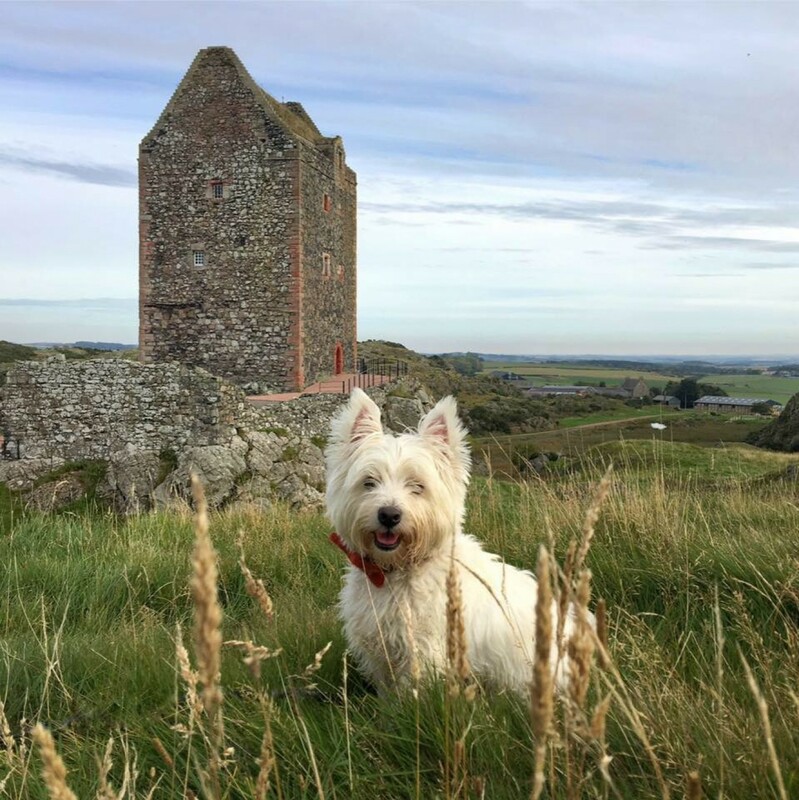 We really enjoyed your walk about Edinburgh with the wee white dug! It is our favorite city and hope to return to explore it again. I’m glad you enjoyed your virtual tour. I hope you get to return again soon. I can’t wait to visit Edinburgh and will definitely make sure we’re there for a few days. Thanks for a great narrative! Thank you, glad you enjoyed. You’ll have a wonderful trip. You have a great hometown! Great photos, thanks for sharing. I have an ancestor buried somewhere in Greyfriars Kirkyard, with all the stacking and moving, there is no headstone, but he’s listed in the book. Oh wow what a place to be buried. Edinburgh is a fascinating city. He was a wee bit in the past – John Falconer, Master of the Scottish Mint under Charles I (about 1640). Died 21 Jun 1670. That’s amazing that you’ve managed to trace your ancestors back so far. Wish i could take the credit, but after a visit to Scotland in 2011, I got interested in my ancestry and after a bit of research, i discovered that another fellow had published a book focusing on Falconers. He already had my line traced back to 1411! It has been more years than I care to remember since we were in Edinburgh as a family. Somewhere around I have photographs of my two boys – very little – at St. Giles, the Edinburgh Zoo ( do they still have the Penguin Parade I wonder?) Edinburgh Castle and Mons Meg – the usual places. Next stop was Stirling on our last tour of Scotland before leaving for Australia – Sweetheart Abbey to Dornoch Cathedral. This was so great to read! I spent a year and half travelling the world and the ONLY city I thought to myself ‘wow… I could live here!”, was Edinburgh! I love it even more after this post ! I’ve also JUST learned that my heritage goes back to Scotland- Edinburgh in particular- my last name is Herriot! Descendant of ol’ Georgie boy! I fully intend to return one day and spend some more time in your beautiful home town! Would love to grab a tea and meet Mr. G and you and learn more about this special town! Excited to dig deeper into my family history now too! Fabulous and outstanding as always! Thanks so much. Can’t wait to follow in your footsteps and explore! I’m a proud Glaswegian but I do love a visit to Edinburgh. The Old Town is full of such mystery and I love hearing and reading the stories of its past. Last year I did the ghost tour to the crypt haunted by the MacKenzie Poltergeist. It was a fascinating and fantastic tour with an awesome guide. I love Glasgow too. So much to do and see there. I adore Edinburgh’s old town history. Greyfriars is my tranquil spot. Some folk are terrified of the place. One of my favourite cities, my grandmother was born there! It’s a wonderful city with such a fascinating and rich history. Thank you – you’ll love Edinburgh when you finally get the chance to visit. It’s a fascinating city. Really enjoyed reading about your hometown. Edinburgh is my favourite city in the world. A visit at least once a year is a must and there is ALWAYS something new and different to look at. I too adore wandering around the Old Town Closes, fascinating. I have not spent as much time in the New Town but would like to – so any walks you do around there would be most interesting. I have seen photos of Dean Village but never managed to visit yet. Any chance you and the wee white dug will be walking that way soon? He is such a fab poser and always has a look on his face that makes me think he is humouring you!! Great images and text. Thank you. I arrived in Edinburgh a little over a month ago and am also thoroughly enjoying its curious and interesting sights and stories. I have been writing up my travels in edinburghexplored.wordpress.com to encourage people to look beyond the tourist hotspots, and it is interesting that some of them overlap with yours today. Edinburgh is a fascinating city and while I live the tourist hotspots these are the streets and stories I adore. I’ll check out your blog as I love reading about my hometown. My wife and I visited Edinburgh in 2013 and it still remains the most interesting city I’ve ever visited. I was born and raised in the US but something about Edinburgh makes me feel at home. Great write-up and photos — they make me want to plan another trip there! Thank you Sam. Wonderful. So much more than we got from our guide one afternoon!